Here is my take on it. I will say - this was very cozy on the day of my 1st glucose test. 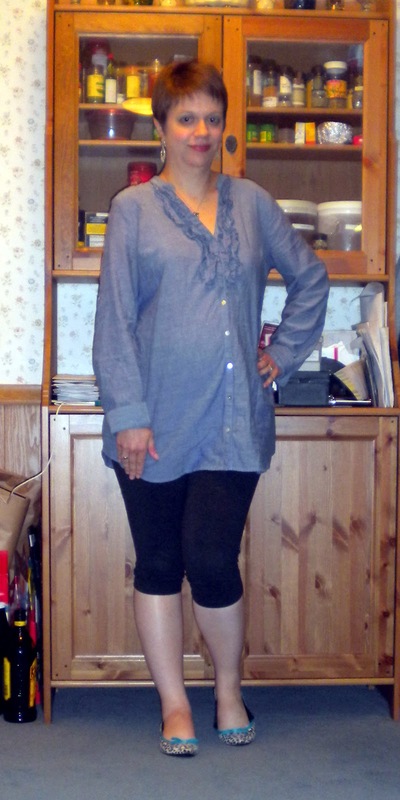 I do like this denim shirt I got at the maternity consignment shop, but I want to try this look again maybe next spring after baby as long as denim shirts are still in style by then! Overall it was a simple and cozy look, I really did like it. I think you should always dress cozy for doctor appointments, it makes them easier to deal with!! Head on over to Heather's blog and check out other Pinspirations! I think it turned out great! Comfort is key when going to the doctor. Good luck today! I love this! Can't go wrong with denim tops. A lot of people even wear them to work around here. I am glad that you were at least comfortable for your test! it is so cozy...especially perfect for this dark weather!! You definitely look comfy! I definitely lurv the denim top!